French gourmet Jean Anthelme Brillat-Savarin called truffles “the diamond of the kitchen.” Black truffles deliver a delicate, more refined flavor than that of white truffles, which makes them a perfect complement to the delightfully pleasing taste of our mashed potatoes. Bon Appétit! Warm days and cool nights, mountain-fed irrigation and rich volcanic soil give Idaho Potatoes their unique texture, taste and dependable performance. 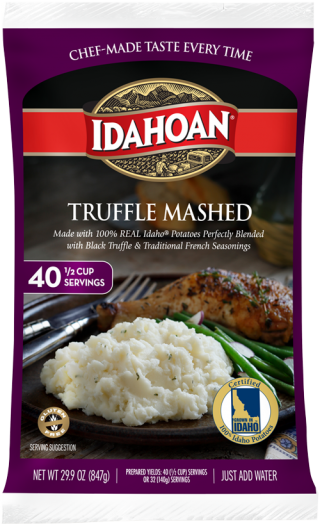 Idahoan is the only major manufacturer that can claim we use Certified 100% Idaho® Potatoes in all of our potato products. 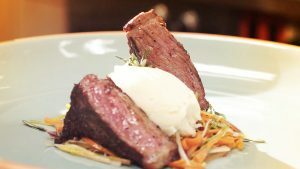 Idahoan makes it easier than ever to get ahead of menu trends. Truffle new product launches in the U.S. are on pace to set a record in 2017. IDAHO® POTATOES, SALT, MALTODEXTRIN, VEGETABLE OIL (SUNFLOWER, COCONUT), NONFAT DRY MILK, MONO & DIGLYCERIDES, NATURAL AND ARTIFICIAL FLAVOR, SPICES, CALCIUM STEAROYL LACTYLATE, CHAMPIGNON MUSHROOMS, SODIUM CASEINATE, DRIED ONION, DRIED GARLIC, ARTIFICIAL COLOR, DISODIUM INOSINATE, DISODIUM GUANYLATE, CORN SYRUP SOLIDS, BLACK TRUFFLE. FRESHNESS PRESERVED BY SODIUM ACID PYROPHOSPHATE, SODIUM BISULFITE, CITRIC ACID AND MIXED TOCOPHEROLS.